I spent a week teaching at Snow Farm but I wasn't ready to leave Snow Farm, so I stayed on and took a hollow glass bead workshop that ran for 3 days. I made a number of glass beads, both in Moretti glass and borosilicate glass. I prefer working in borosilicate glass which is often called "boro" glass by lampworkers and glass artists. Using a propane and oxygen torch that is clamped to a fire-proof bench, 1/4" glass rods of assorted colors are heated in the flame and melted onto a steel rod. Using dots, stripes, swirls, marblizing patterns, you can get a very wide range of patterns, shapes and colors. 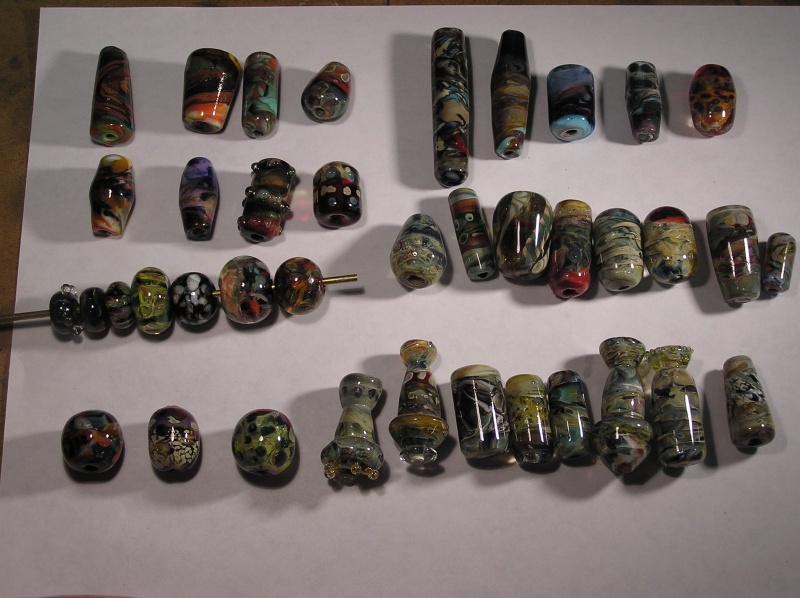 I have a tough time doing round beads, so I make a lot of large tubular and bi-cone beads. This time, using boro glass, I was able to make more roundish beads and some interesting shapes. 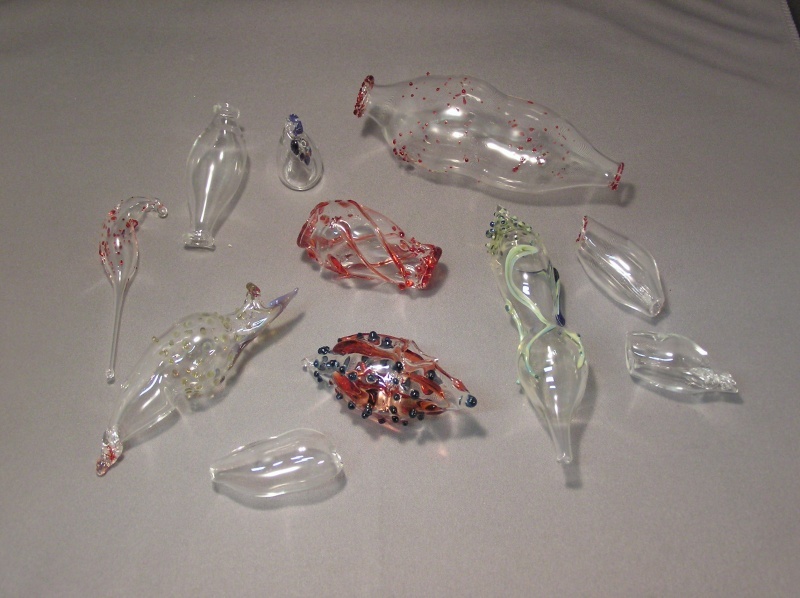 I also made a small number of hollow glass beads and forms, all out of boro glass. It is safe to say I will never be a hollow form glass artist - it drove me crazy trying to keep the hollow beads and shapes symmetrical. I rather make beads in boro glass. Boro glass has an incredible range of colors and metallic tones that are out of the world. Moretti glass, often called soft glass, is a lower-melting glass that is more brittle, and I find it too "droopy" to work with. The colors tends to be opaque or transparent, with very little of the incredible metallic shimmer that boro glass is known for. Boro glass is stiffer, requires more heat to work with, but I like the stiffness of it compared to soft glass. Now, I have to figure out what to do with my beads. I have many beads in my drawers, since I have been working with hot glass off and on for over 20 years. I have even blown glass in college and it's not as easy as it looks. Glass is a second favorite material to work with. Metal is my first love, glass and photography are a close second. Fortunately, I'm able to do all three. I do all the photography in my webstore if you were wondering where's my photos.